Four days before the race I flew from DC to Detroit. When I got off the plane, my hips and knees were killing me. Like I didn’t even want to walk. Hip soreness if pretty normal for me when I’m running, but knee pain (and hip pain) was completely new. I couldn’t even sleep through the night because I was so uncomfortable. So, race day arrived and I did not want to run. I always have major nerves before a race but this was the first time that I just really had no desire to start. But start I did. 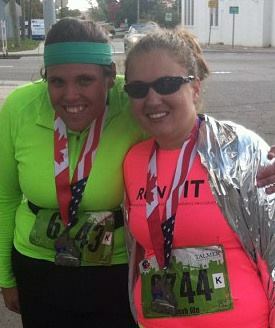 Jessica and I had planned to run together and started pretty strong. I’d had doubts about the race and a couple months ago told her I was going to change my registration to the half marathon because I didn’t think I’d be ready. Then my stubbornness kicked in and I told her that I’d do it…I just might have to walk a lot. We started well, the hill over the Ambassador Bridge was much longer than I remember but I felt strong. DC is hilly so hills don’t often intimidate me anymore. We got over the top and made it back down to have Journey greetings us in Canada again. After getting a high five from Canadian border patrol, we set out for a few miles in Canada and I got my yearly orange slice. Around mile 6 we took a short break to have some Honey Stingers and then continued on our way. The tunnel. Oh the tunnel. It ends. This will end. This doesn’t last forever. I kept repeating this the whole time. It somehow helped. My third time through the tunnel was definitely the easiest. I felt pretty strong and the outside-tunnel-outside temperature changes weren’t as jolting as they have been the last two years. And the US CBP guys were much friendlier this year. They weren’t blocking the course and they were smiling. Yes, smiling. (Of all the international border crossings I’ve done, the people at the Detroit-Windsor crossing really give all the other pleasant CBP folks a bad name. They are never having a good day.) I even got a high five from one! Coming out of the tunnel, Jessica jumped to touch the Welcome to the USA banner. I decided I didn’t want to try and fail in front of hundreds of people so I just smiled. At about mile 10 I started smiling. I couldn’t help myself. We went under an overpass that had hundreds of people on it, they were cheering and holding signs and all of a sudden, I knew I was going to finish. There was no longer any doubt. “I can do this. I’m going to do this,” kept running through my head. Soon after this, I needed the bathroom. Like now. I started training with Honey Stingers many months ago and was pleasantly surprised how well I could handle them. With dietary restrictions preventing me from eating just about anything processed (and especially anything with honey), it seemed crazy that Honey Stingers were fine. That is, until a few weeks ago when all of a sudden they were not. So close to the race, I didn’t think I had time to figure out something else to eat and it really wasn’t that bad. But during the race I had to use the port-a-potty not once but three times. At about mile 11.5 Jessica started mentally preparing us for the half/full divide. We’re going left. We’re following the signs for the full marathon. We’re heading into uncharted territory. Yeah, yeah. I kept saying. I was still feeling pretty strong and wasn’t worried about wanting to veer off. As soon as that divide happened, that changed very quickly. Just past mile 13 I had a weird pulling/pain/irritation on the front of my left hip that I’d never had before. I ran until 13.5 and then wanted to walk a bit. By this time my feet were starting to hurt as well and I came crashing down from the high I’d been on for a couple miles. I told Jessica to keep running and she refused. We walked for quite awhile and the pain went away so I started running again, as soon as I did it came back. We were in Indian Village at the time. I’d never been to that neighborhood of Detroit. Wow big houses. With gates. For blocks and blocks and blocks people were outside right at the curb with fancy patio furniture having parties. One group had a line of crockpots with toothpicks for people to pick out what they wanted. Another had so much beer I’m sure they must have bought out the entire city and were handing out cups or cans to runners. I tried to start running again and hated it. But I continued for a mile. And then quit. That’s when I started crying. Jessica gave me some tough love and told me I could either ask the police officer for a ride to the finish or I could finish. I said I’d finish. But that I was walking the rest of the way. I was basically throwing a temper tantrum. I was stubborn enough to finish the race, but I was going to do it my way. We walked for a few miles. I told Jessica to leave me. She again refused. Finally, at mile 23 she took off. We were both running. I ran until just after mile 24 and was going to run mile 25 to the finish. But there was no sign for 25. I thought I was going insane. Really. No sign. I cried because I thought it was the longest mile in history. My dad caught up to me and said, “I’m proud of you, Hannah!” I responded, “I hate myself so much right now.” He laughed and just said that’s what a marathon feels like. Training properly is important. Duh. Don’t start a race with a bad attitude. Nothing new on race day is good advice, but if what you’ve been doing hasn’t worked, don’t keep doing it. Apparently flying makes my legs hurt?! This wasn’t the first time I’ve been sore after flying but it was certainly the worst. I can work harder and will next time.